Mass spectrometry has become essential to sports drug testing. 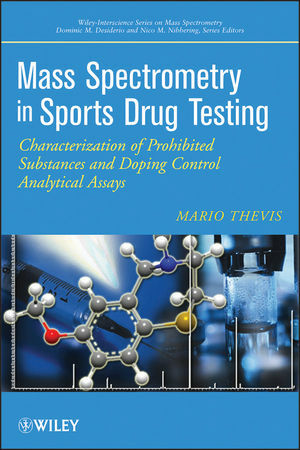 This book examines both the principles of sports drug testing and the use of mass spectrometry techniques and mass spectral data to detect, identify, and characterize hundreds of known and unknown drugs that athletes may use to enhance their performance. The author provides a detailed overview of the mass spectrometry of numerous classes of therapeutics and agents, various analyzers to detect low- and high-molecular weight drugs, as well as techniques to discriminate between endogenously produced and synthetically derived compounds. Throughout the book, descriptive examples illustrate the principles, advantages, and limitations of different assays. Mass Spectrometry in Sports Drug Testing not only sets forth the role mass spectrometry plays in detecting drug use among athletes, it also adds new insights into the health and ethical issues of doping in sports. Mario Thevis, PhD, is Professor for Preventive Doping Research at the German Sport University Cologne. He has published more than 115 articles in peer-reviewed journals, mainly on mass spectrometry and sports drug testing. Dr. Tevis is often invited to national and international conferences as a speaker and keynote lecturer on mass spectrometry and doping controls. 1 History of Sports Drug Testing. 1.1 Historical Attempts of Artificial Performance Enhancement. 1.2 Background and Rationale of Doping Controls. 1.3 Early Detection Methods: Possibilities and Limitations of Assays Without Mass Spectrometry. 1.4 Introduction of Mass Spectrometry to Doping Control Analysis. 2. Mass Spectrometry and the List of Prohibited Substances and Methods of Doping. 2.1 Criteria for the Mass Spectrometric Identification of Prohibited Compounds. 2.2 Modern Mass Spectrometers in Doping Controls: Advantages and Disadvantages of Available Techniques. 3. Structure Characterization of Low Molecular Weight Target Analytes —Electron Ionization. 3.4 Selective Androgen Receptor Modulators (SARMs). 4. Structure Characterization of Low Molecular Weight Target Analytes: Electrospray Ionization. 4.4 Selective Androgen Receptor Modulators (SARMs). 4.8 Peroxisome-Proliferator Activated Receptor-δ (PPARδ) And Adenosine Monophosphate Activated Protein Kinase (AMPK) Agonists. 4.9 Hypoxia-Inducible Factor (HIF)-Stabilizers And Sirtuin Activators. 4.11 Glucuronic Acid and Sulfate Conjugates of Target Analytes. 5. Structure Characterization of High Molecular Weight Target Analytes: Electrospray Ionization. 5.1 Human Chorionic Gonadotrophin (hCG). 5.5 Hemoglobin-Based Oxygen Carriers (HBOCs). 5.6 Human Growth Hormone (hGH). 5.8 Insulin-Like Growth Factor-1 (IGF-1). 6. Modern Mass Spectrometry-Based Analytical Assays. 6.1 GC-MS and Isotope Ratio Mass Spectrometry. 7. Limitations and Perspectives of Mass Spectrometry-Based Procedures in Doping Control Analysis. 7.3 Profiling of Urine and/or Blood.